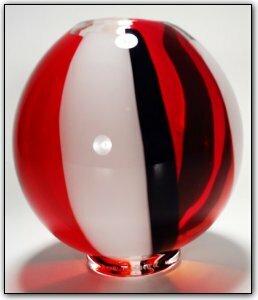 This modern shaped round vase sits atop a clear glass pedestal and features bright cherry reds, black and white glass to capture the feeling and joy of a carnival. This is a wonderful piece from McGuire's new Carnival Series and would add a colorful accent of design to any room. **SPECIAL DISCOUNT** Purchase any 3 items from Nicolaus McGuire's new Carnival Series and receive a 10% discount on the trio, purchase any 4 items from the Carnival Series and receive a 15% discount on the quartet. The entire Carnival Series can be viewed in the "Signature Series" section of our website. This is a limited introductory promotion to introduce the new series, so act fast while its available!